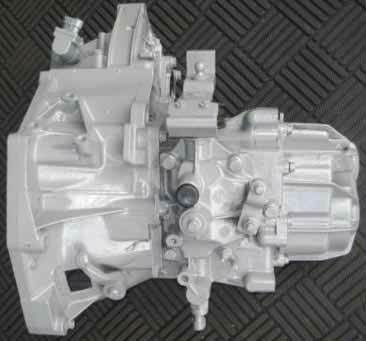 One of the most common failing gearboxes we recondition is found fitted to the Fiat Punto. This common failing 5-Speed Manual Gearbox has many weak points, we see these boxes fail and come in with various problems including: Front Bearing Failure (Lay-Gear / Input shaft), Worn Out Gears and Gear Hubs, Pinion Bearing Failure, Crown Wheel Failure and so on. We upgrade the components when rebuilding the Fiat Punto gearbox, some of which include an uprated roller bearing and a bolt-on crown wheel. Depending on how the gearbox has failed, you may experience various problems and if a gearbox fault is caught in the early stages, the repairs can be much cheaper. Note: If the front bearing has failed, you may need to change your clutch due to oil contamination. Commonly when your gearbox fails, most garages and dealerships will only advise on replacing the unit. A new replacement gearbox can work out to be very expensive and comes with a 12 month limited warranty. Used second-hand parts are a common choice for motorists because they are cheap – but they will also come with a limited 30-90 day warranty and being that these gearboxes are such common failures, you may end up developing a fault with the second gearbox. We are able to fully strip & rebuild the Fiat Punto manual gearbox. When rebuilding the gearbox, we use new genuine OEM components and uprated parts where possible to ensure each and every rebuilt gearbox meets & exceeds OE specifications. All of our reconditioned gearboxes come with a 2 Year unlimited mileage warranty. We also offer free fitting at our gearbox service centre. If you have a Fiat Punto with a manual gearbox fault, call us today on 0844 847 9999. Tags : Fiat Punto Gearbox Problems, Fiat Punto Gearbox Rebuilds, Fiat Punto Gearbox Repairs. Hello Do you repair Fiat Croma gearboxes too ? my fifth gear no lnger works, it wont stay in fifth gear, and reverse gear is playing up too now. I’ve sent you an email just now with full pricing and information for a Fiat Croma Gearbox repair. I have a fiat Punto Grand 59 Reg,, 5 speed, 1.4, gearbox needs replacing can you quote me please. We’ve sent you an email with pricing and information including our fitting service. punto 1.2, 5 speed, 04 reg, noisy whine in 1st gear, is this fixable ? I’ve sent you an email just now with full pricing and information for a Fiat Punto Gearbox repair. 2004 fiat punto 1.2 engine. gETTING A WINDING SOUND COMING FROM THE GEARBOX MAINLY IN 1ST AND 2ND GEAR. We can definitely help, we’ve sent you an email with full pricing and information on our services available to you. I have a fiat grande punto semi automatic I have problems with the grearbox its stuck in reverse how can I free this? We have sent you an email with full information and pricing for the possible causes of this type of failure. quote for gear box repair no first and second gear.